Duke Energy's World of Energy education center at Oconee Nuclear Station near Seneca will host a family event celebrating National Hunting and Fishing Day from 9 a.m. to 3 p.m. on Saturday, Sept. 24. This free family adventure is open to the public. Cabela's' pro bass angler Martha Goodfellow will be at National Hunting and Fishing Day at the World of Energy near Seneca on Saturday, Sept. 24. Goodfellow will be teaching and conducting interactive demonstrations throughout the day. National Hunting and Fishing Day is made possible by partnerships with the S.C. Department of Natural Resources, Cabela's, Upstate Forever, Trout Unlimited, Clemson University Cooperative Extension, Clemson University 4-H Shooting Sports, Harry Hampton Memorial Wildlife Fund, U.S. Sportsmen's Alliance Foundation, The Weatherby Foundation, Elkmont Trading Company, Academy Sports & Outdoors and Duke Energy. To celebrate the 10th annual event, Cabela's' bass angler Martha Goodfellow will be on site teaching interactive demos throughout the day. Goodfellow has fished in numerous tournaments throughout the South, capturing third place in Texas on Lake Ray Hubbard during her first tournament as a pro. She finished the lady bass angler season qualifying for the championship on Alabama’s Lake Guntersville, where she placed second in the event. 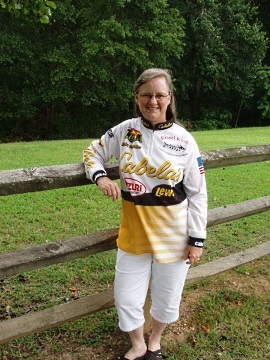 In her spare time, she serves as director of the South Carolina Couples Series division of American Bass Anglers. In addition to interactive demos with Goodfellow, National Hunting and Fishing Day activities include archery, air rifles, rock wall climbing, fly tying and casting, kayaking, fishing on Lake Keowee and much more. All activities are free, and all gear is provided. "Clemson Extension and the Clemson 4-H Shooting Sports program are proud to be partners for the past 10 years with this celebration of hunting and fishing and the outdoors," said Rick Willey, 4-H natural resource specialist. "We look forward to this event every year. It is a great opportunity for the community to come and enjoy the great outdoors in a safe, educational environment with family and friends." Shuttle service is provided from the marked parking area off SC Highway 130 across from the entrance of the World of Energy. Guests can bring a picnic lunch or purchase food on site. For more information about the Sept. 24 National Hunting and Fishing Day event, contact Duke Energy's World of Energy at 1-(800)-777-1004, option 1, or visit www.duke-energy.com/.